We know we share a common ancestor with Neanderthals, the extinct species that were our closest prehistoric relatives. But what this ancient ancestral population looked like remains a mystery, as fossils from the Middle Pleistocene period, during which the lineage split, are extremely scarce and fragmentary. Now, researchers have applied digital 'morphometrics' and statistical algorithms to cranial fossils from across the evolutionary story of both species, and recreated in 3D the skull of the last common ancestor of Homo sapiens and Neanderthals for the first time. The 'virtual fossil' has been simulated by plotting a total of 797 'landmarks' on the cranium of fossilised skulls stretching over almost two million years of Homo history — including a 1.6 million-year-old Homo erectus fossil, Neanderthal crania found in Europe and even 19th century skulls from the Duckworth collection in Cambridge. This allowed researchers to work out how the morphology of both species may have converged in the last common ancestor's skull during the Middle Pleistocene — an era dating from approximately 800 to 100 thousand years ago. Previous estimates based on ancient DNA have predicted the last common ancestor lived around 400,000 years ago. However, results from the 'virtual fossil' show the ancestral skull morphology closest to fossil fragments from the Middle Pleistocene suggests a lineage split of around 700,000 years ago, and that — while this ancestral population was also present across Eurasia — the last common ancestor most likely originated in Africa. However, the face of the virtual ancestor shows hints of the strong indention that modern humans have under the cheekbones, contributing to our more delicate facial features. In Neanderthals, this area — the maxillia — is 'pneumatized', meaning it was thicker bone due to more air pockets, so that the face of a Neanderthal would have protruded. 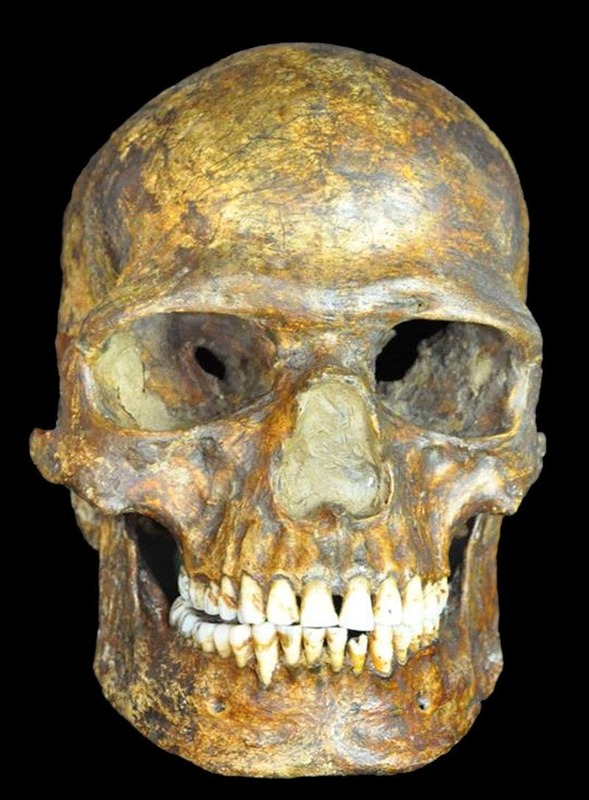 The image above is a fossil skull from Kostenki 14, one of the earliest and most complete modern human skulls that shared genetic ancestry with hunter-gatherers in Europe, as well as with the early farmers. (Courtesy Dr Marta Lahr, Cambridge University). Today's 'Galaxy' Insight –"The Accidental Evolution of Homo Sapiens…"